blushing basics: Too Many Pashminas? for this week's fashion friday we're going to do a little recycling. it is all about taking something old and making it new, without spending $$$. i was recently perusing the Top Shop web site (i like to get outfit ideas here, they seem to be on top of the latest trends) and i found SNOODS. what is a snood? it is a scarf that acts as a scarf/hood/hair wrap. they had so many snoods to choose from it was only a question of which fabric i liked best. ...and then i saw the price. $30 for a snood? really!? i know this little piece is adorable but i can't part with that many bones for something so simple. this is where you get creative. 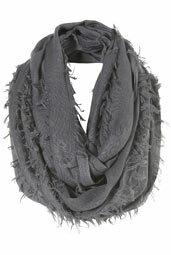 pashmina scarves have been around for years now and i'm sure all of you have a scarf or two in your closet. i personally had three so i decided to do a little surgery. once you are complete enjoy your finished product. i enjoy taking something old and making it new. do you have any items you have done this with? if so, i would love to hear. Ask your sister...sewing is so not easy for me! But I may give it a try because this is adorable. Thanks for the ideas! Keep em coming! Dang it, if only I had a pashmina! I knew I should have bought one years ago when they were all the rage. It turned out super cute, Kristie! Love your snood:) I will totally try it! aw thats a great idea love it!! your doing a great job on your blog hun! !